I can easily spend hours in lighting stores. The textures, finishes and shapes mesmerize me. Sometimes my husband gives me a look, cueing me that we’ve been under the lights too long. Like a child getting kicked off an iPad, I try to soak up every remaining minute. I completely understand why someone would choose a career in lighting because it’s where form meets function. I’ve had the privilege of speaking with three Rochester women who work in the lighting industry: Becky Holmen, Ami Olson and Heather Hughes. They’ve been able to combine their knowledge of lighting with their love of people. Their insights may even pique the interest of anyone looking for a “bright” career. Sometimes, identifying our strengths is what leads us down our career path. This was the case for Heather Hughes, lighting specialist at Dakota Supply Group (DSG) in Rochester. Hughes began as an electrical manager at Menards. “When I first started out in electrical, I had opportunities to help customers design houses and apartment buildings. I realized it was something I really enjoyed doing and was a strength of mine.” Recognizing this strength is what led her to become a lighting specialist. Hughes shares her take on the issue, “I think everyone has challenges in the lighting industry. I don’t feel being a woman makes any difference.” After two decades in the field, it’s very encouraging to hear it has not been an issue for her. It’s absolutely clear that LED is the top trend in lighting. 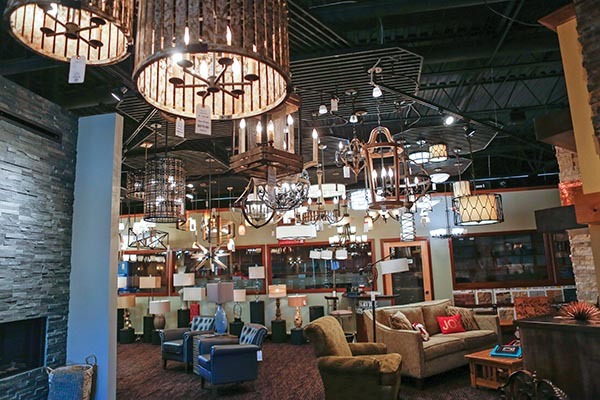 Olson says, “I think LED lighting is one of the best inventions to hit the lighting industry. Imagine the amount of electricity it takes to run a 100-watt bulb. Now cut that down to a 15-watt LED bulb that will give you same lighting output without using the same amount of electricity.” LED bulbs are also cooler to the touch, saving both energy and the homeowner’s fingers. Minnesota code regulates that 75 percent of all new construction lighting must be energy efficient. Rochester Public Utilities (RPU) offers energy rebates for those switching over to LED and energy efficient lighting. They do energy audits for commercial sites, helping them reduce energy costs. WT Lighting offers a complimentary service to homeowners. They provide an estimate on the cost of switching from incandescent lighting to LED lighting. Hughes has observed another trend: Kelvin color changing lights. These lights adjust from warm white to bright white, reducing the need for multiple bulbs. These new innovations keep the lighting industry ever-changing and always interesting. It’s no wonder so many women find the lighting profession to be such a great fit for them. Sara Lohse is owner and professional organizer at The Rescued Room, TheRescuedRoom.com. This entry was posted in Personal & Professional on January 2, 2019 by Sara Lohse.